As many of you know, I have always considered myself “in-doorsy” and my favorite kind of camping is the kind where I don’t go. 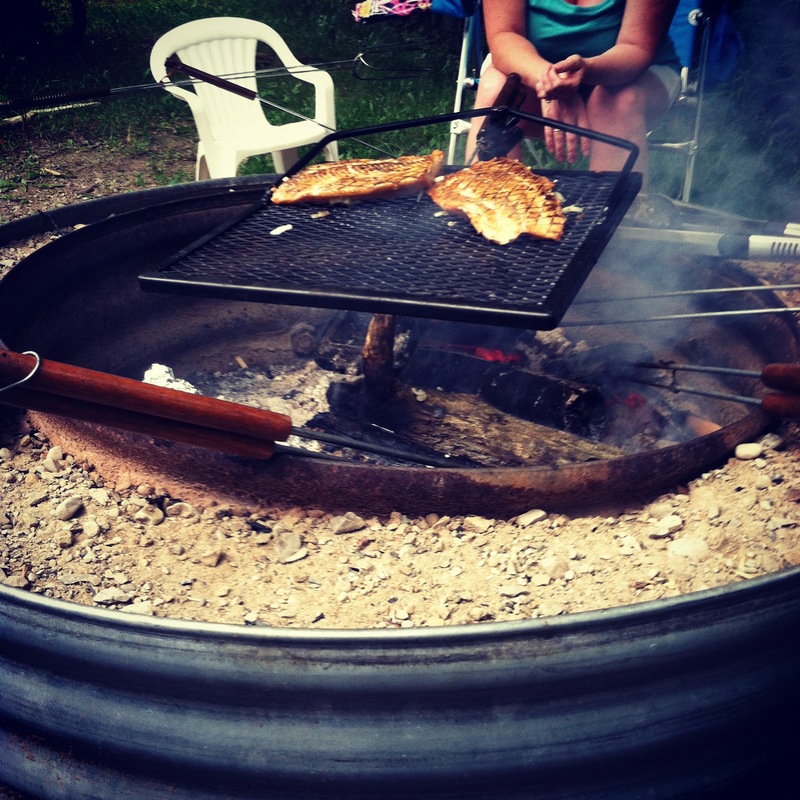 I wasn’t raised in a camping family. 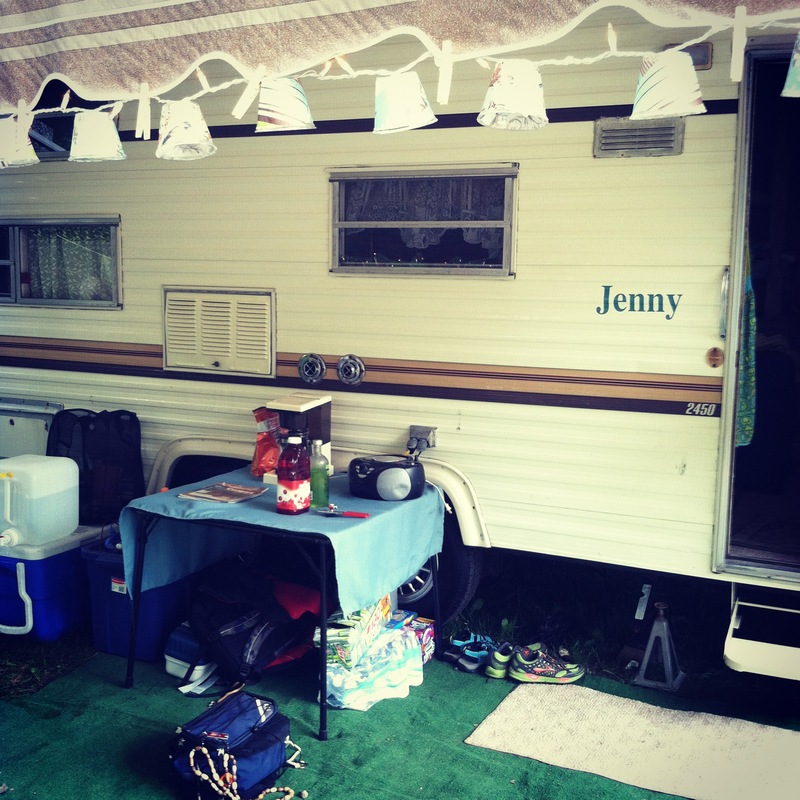 In my house growing up, camping was definitely not a vacation… it was work! Then I grew up and got married. Once I was married I realized…. I married a CAMPER! 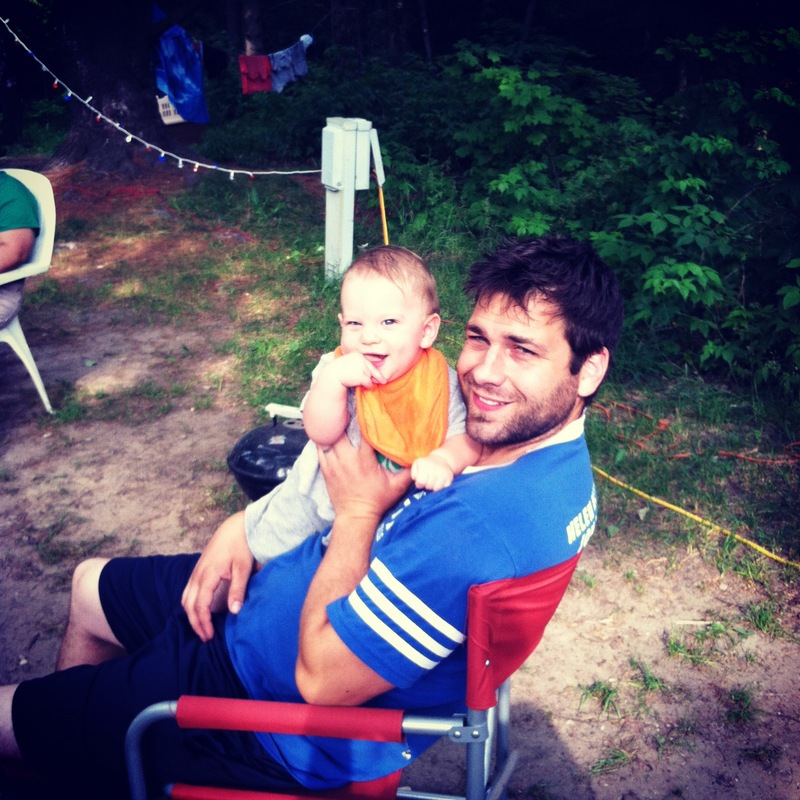 Not only did he like/love to camp, but his whole family camped! Even his family’s extended family camped. And just when I thought everyone who loved camping was accounted for, I was told their DOGS camped too… I realized I was screwed. 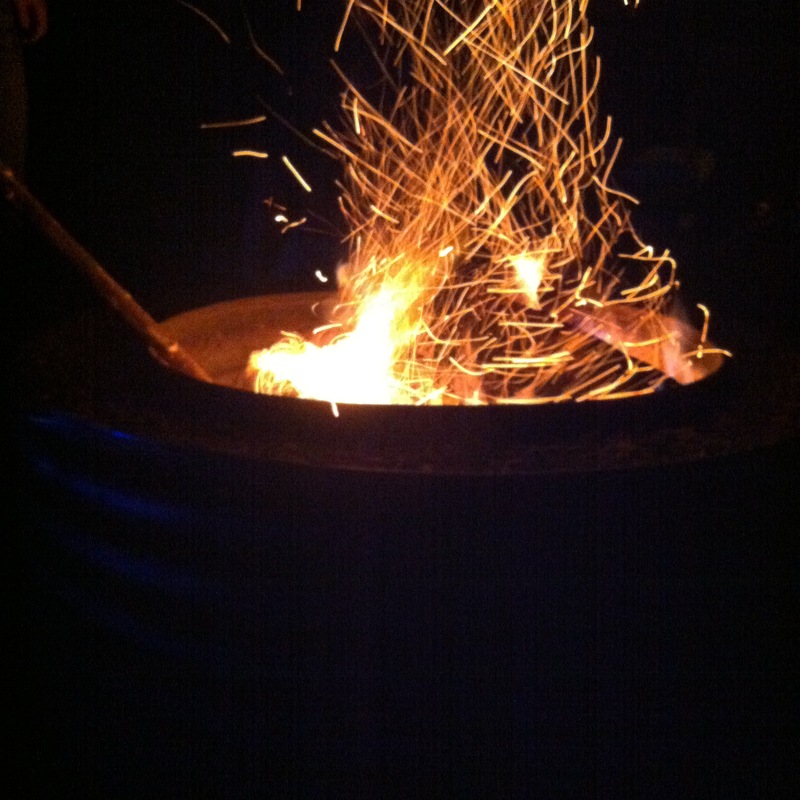 Camping was in my future and I could either like it or love it. Goodbye nice hotels with room service and cable tv, goodbye quaint towns filled with antique stores and restaurants, goodbye exciting night life and champagne in the jacuzzi…. Hello woods, and dirt, and bugs, and man-eating predators. Since I knew I had to go camping, I tried to think of a way that I could make everyone happy including myself… there was only one solution… GLAMPING! Glamorous camping! 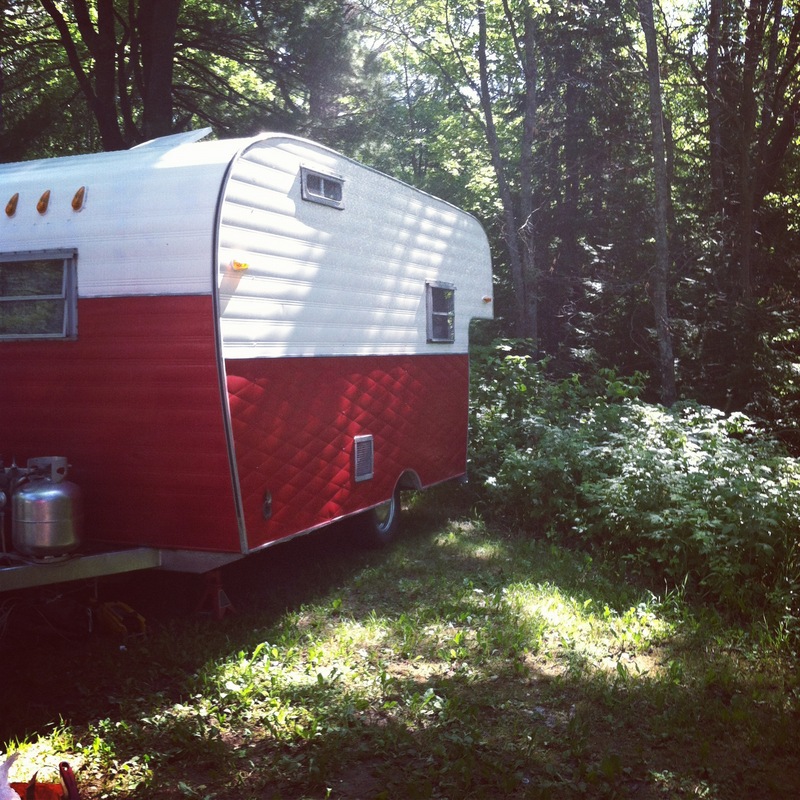 I scoured the internet for a small vintage camper in need of some TLC and lo and behold… I found one! A little 60’s number that we rehabbed and affectionateely named “Gertrude”. I think every vintage camper should have a vintage name. I found that the more love I put into Gertrude, the more excited I was about camping… and my husband definitely appreciated my new outlook. Nobody wants to camp with somebody grumpy. It’s part of the camping code. I know about the code now becasue I’m cool like that. 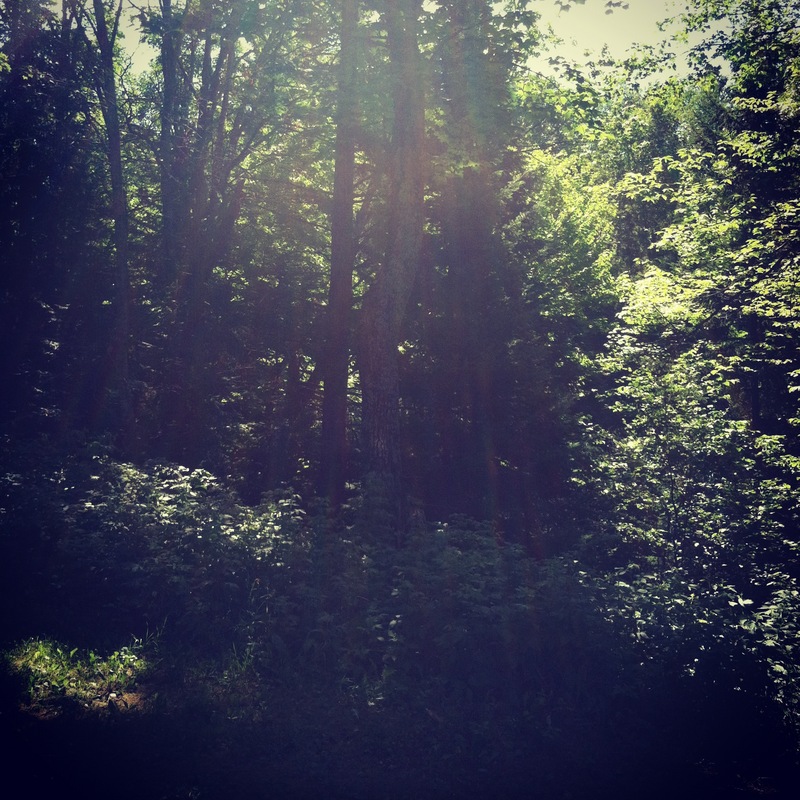 In July 2012, I took my second ever glamping trip. We went in 2010, then in 2011 I was quite pregnant with our first child, and this year I had no good excuse! Not that I really wanted one… It’s so nice to see everyone. Like I said, everyone in my husband’s world camps so we end up with quite a large group. We call our little group “Camp La-koh-ver-no-rill-et” which is a funny combination of all our last names. 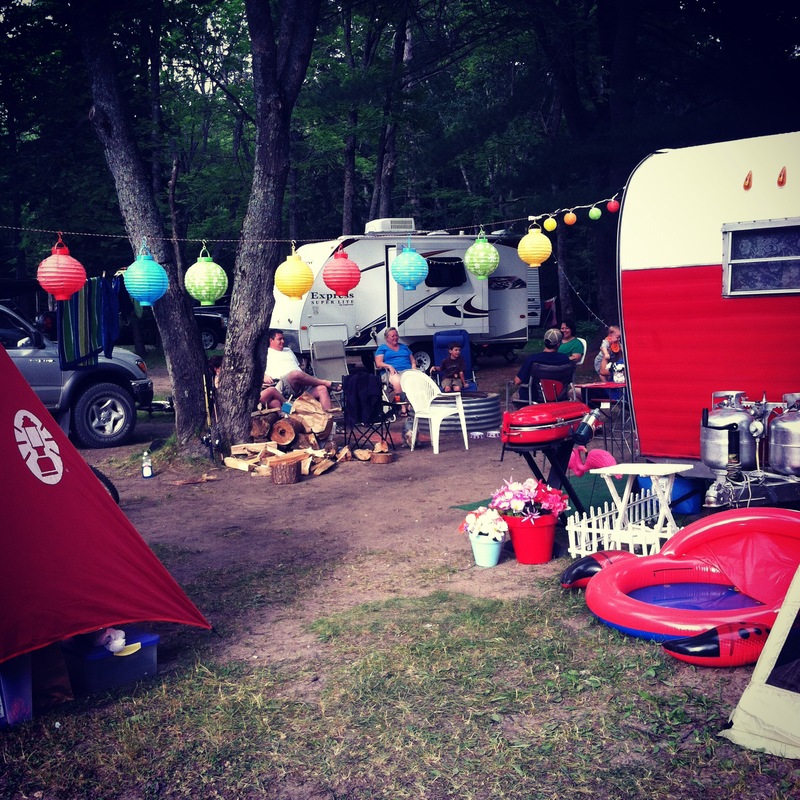 Every family takes turns cooking meals, the kids play, nature hikes are taken, swimmimg is a given, and every night there are smore’s and adult beverages around the campfire. I’ve come to enjoy camping because I love and enjoy the people I camp with… and it goes to show you, it doesn’t matter what you’re doing, just have fun while you’re doing it. Here are some pictures of our trip! 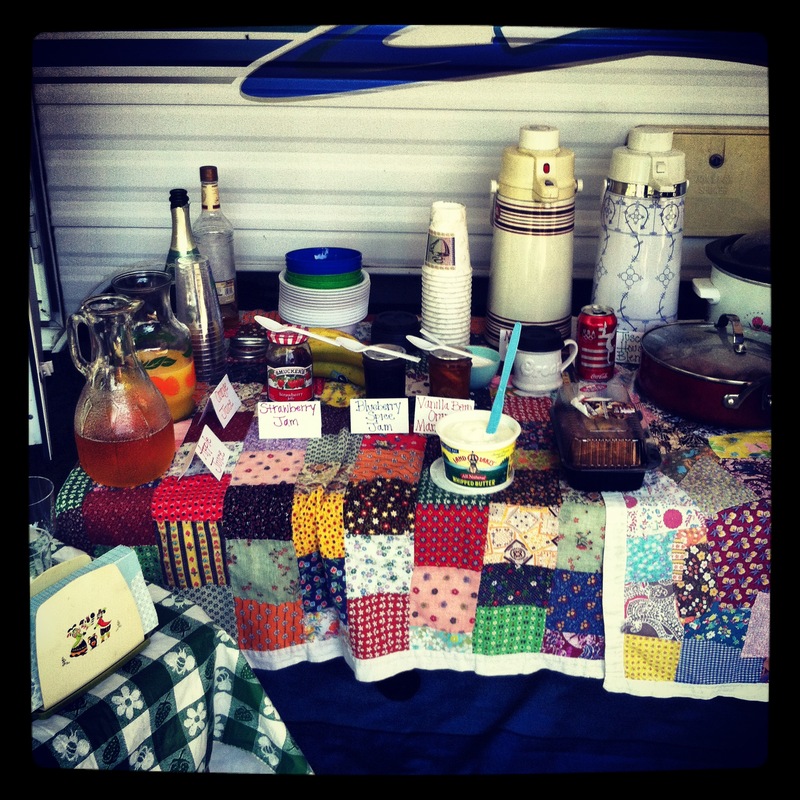 Here is our little Gertrude all set up on our site! Isn’t she adorable? This is our beautiful view. We were camping at Taqhuamenon Falls in the UP. 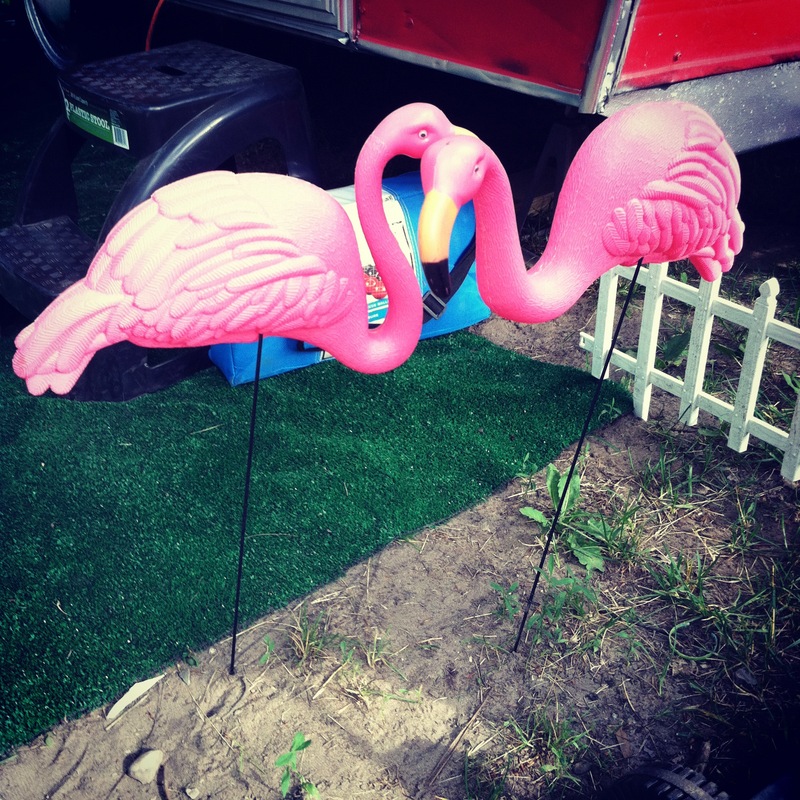 You can’t glamp without plastic flamingos! 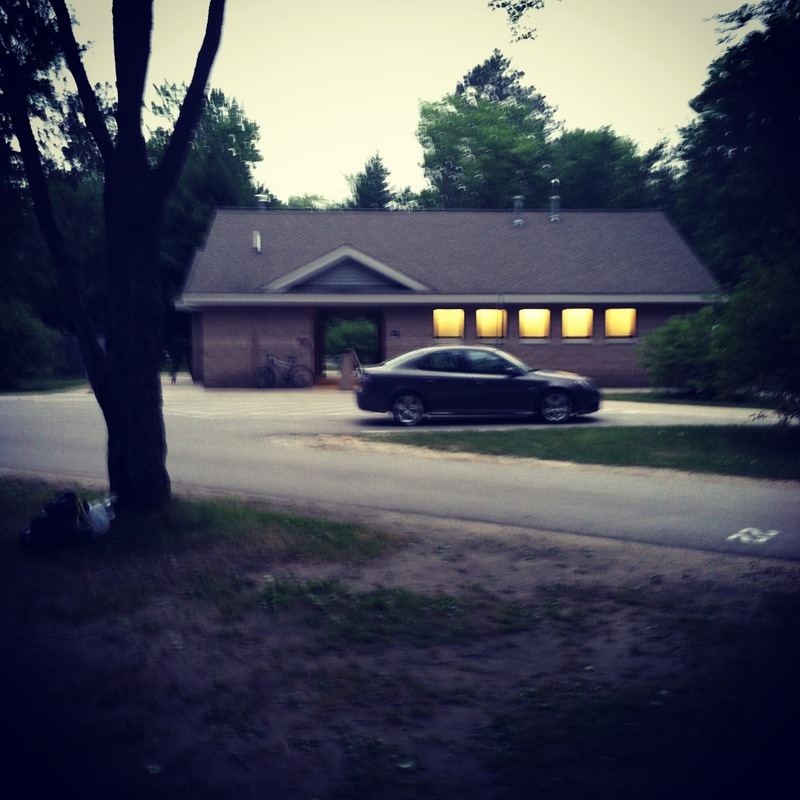 A view of the bathrooms… not totally hideous…. but it still makes a girl miss the Holiday Inn! This is my sister in law’s glamper! 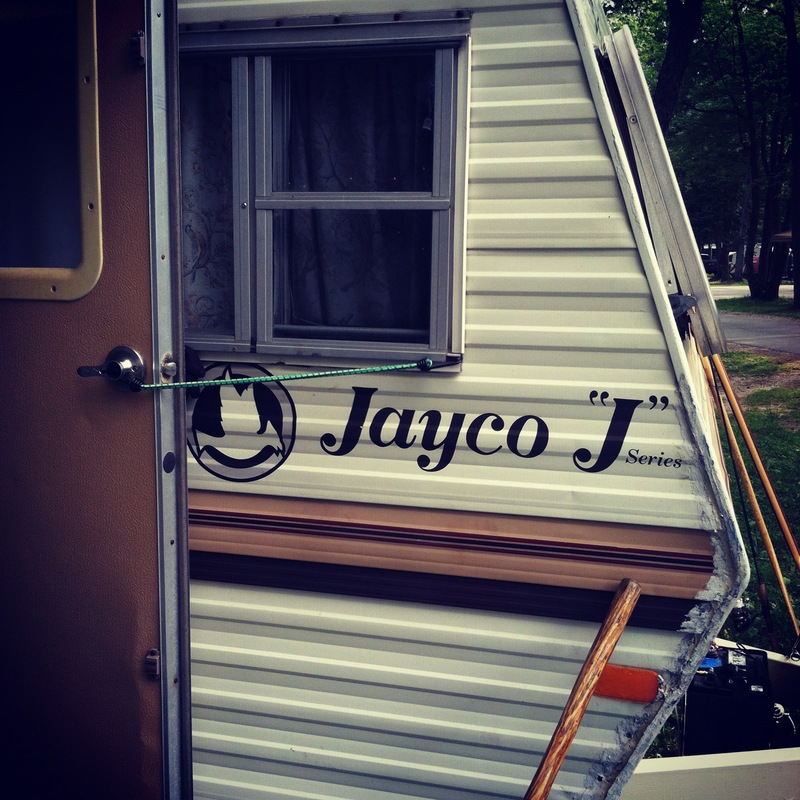 Jenny the Jayco! Too cute… love it! I believe this is a late 70’s or early 80’s model? She has it so cute inside and her family loves it. They use it a lot more than we use ours because they’re super duper campers! 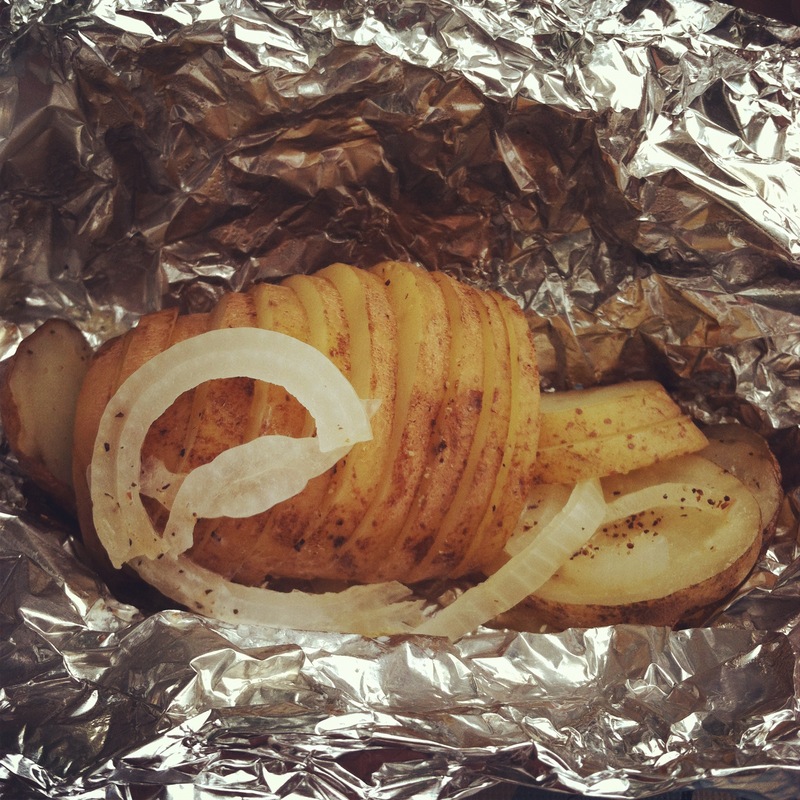 Potatos and onions in a tin foil package. Wonderful! Pizza Hobo Pies! I was a hobo pie novice, but they turned out great! 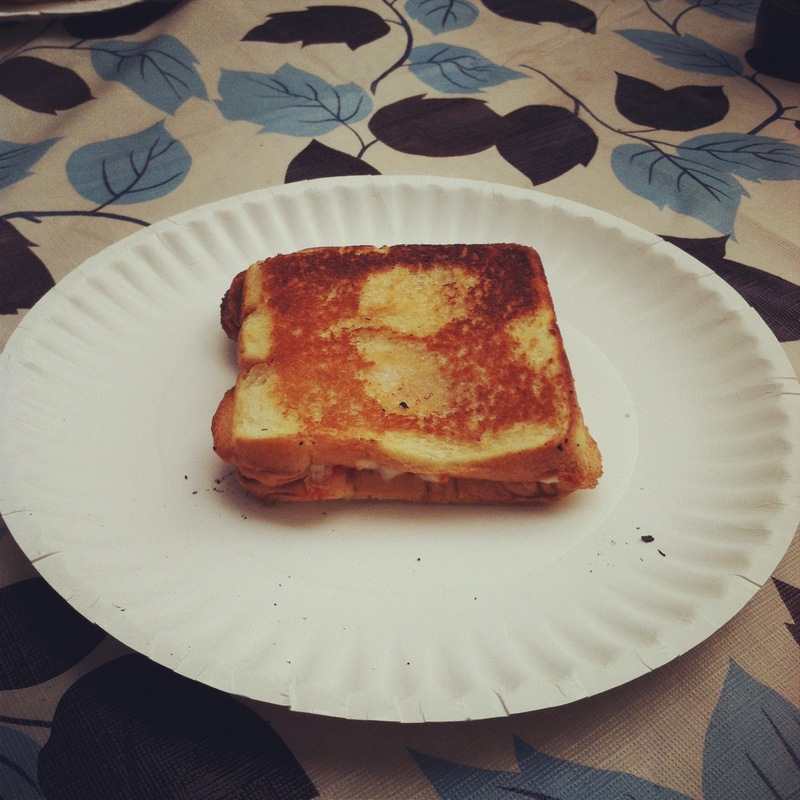 Thanks for teaching me Trish! My husband and I did an oatmeal bar for breakfast. 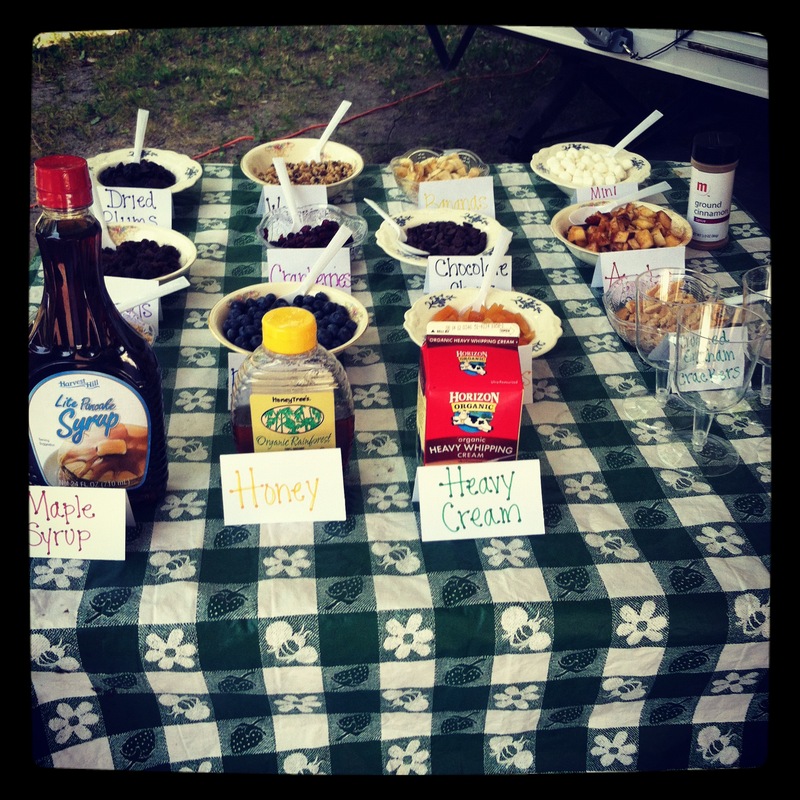 Tons of toppings, hot oatmeal in a crockpot, bacon, toast, mimosas, coffee, and juice. Phew! In the small neighboring town, there had been wild fires ripping through. This was painted on a store front window. My husband is part of a fire fighter family all around the world. 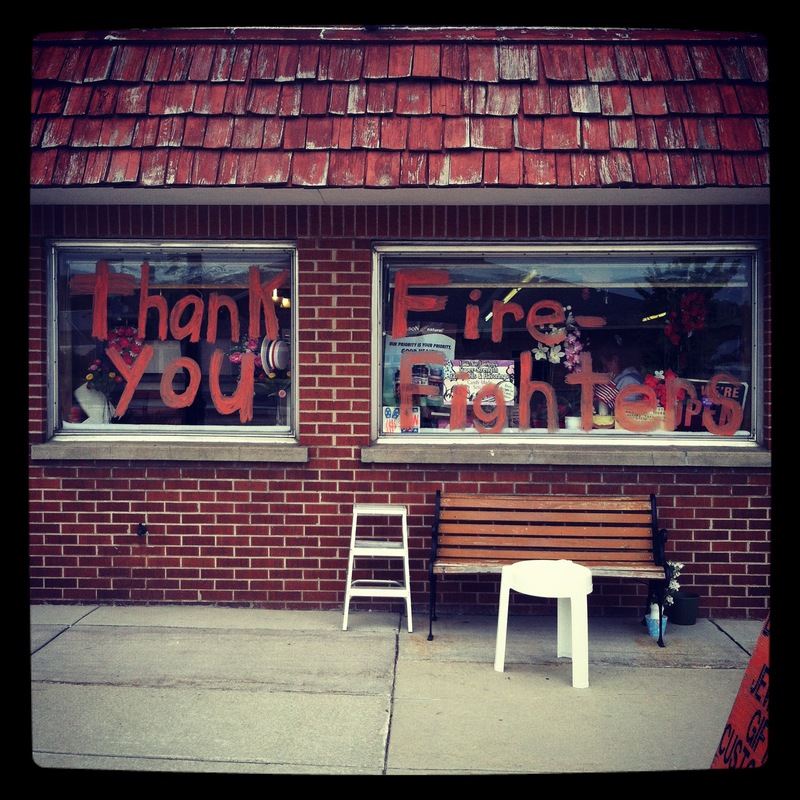 I thank all of them for what they do everywhere…this was so nice to see. I hope you enjoyed my glamping trip as much as I did. 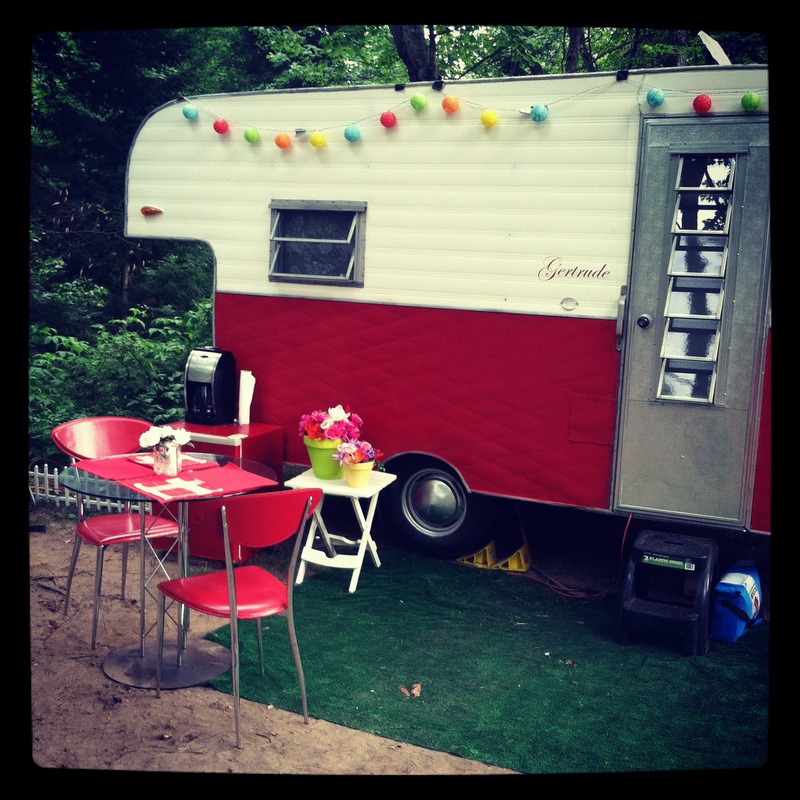 Are you a camper/glamper too? Where do you go? What do you do? I’d love to hear about it. Thanks for stopping by and I hope to see you back real soon.